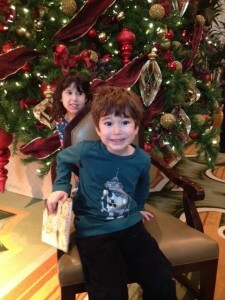 For the last 7-8 years around the holidays, I’ve been taking my little kids to the Peninsula Chicago for lunch with my husband’s two sisters. This year we spiced things up and met for breakfast. One sister-in-law just had a baby, so she didn’t join us. But my mother-in-law did! Here the kids ham it up for the camera. They loved their Peninsula activity books! 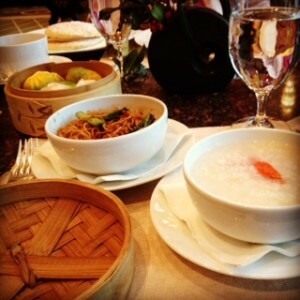 I ordered the Chinese breakfast, which I’ve had before. The Pen has changed it up a bit since the summer. This new version includes lobster congee, pan-fried noodles, and dumplings. 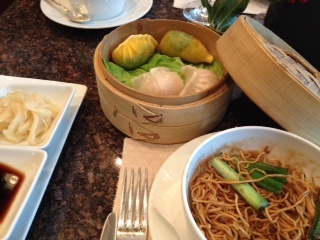 A close-up of the dumplings and noodles. 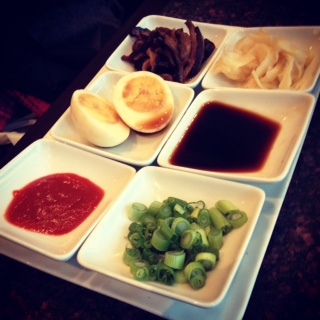 And here’s the tray of condiments (sweet shiitake mushrooms, pickled ginger, green onion, a hard boiled egg, dipping sauce, and chili sauce). 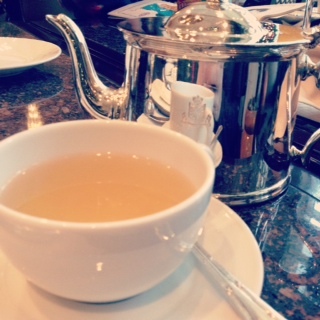 A Christmas-week lunch at the Peninsula with your sisters-in-law and mother-in-law sounds like a wonderful custom. Your kids look like they enjoy it too. Thank you so much! It was a lot of fun. Last year we went to the Peninsula for Chinese New Year, so it will be fun to repeat that for the Year of the Horse. Now just to convince my husband! Yum! The soymilk makes me think of my MIL’s homemade soymilk — great sweetened or savory. And the pan-fried noodles look incredibly similar to those served around this region. Wish you happy holidays, Susan! Thank you so much, Mei! I only wish they had brought out the soy milk. Next time I’ll remember. The pan-fried noodles were excellent. A friend brought some over today for a play date with our kids–totally veg and delicious! 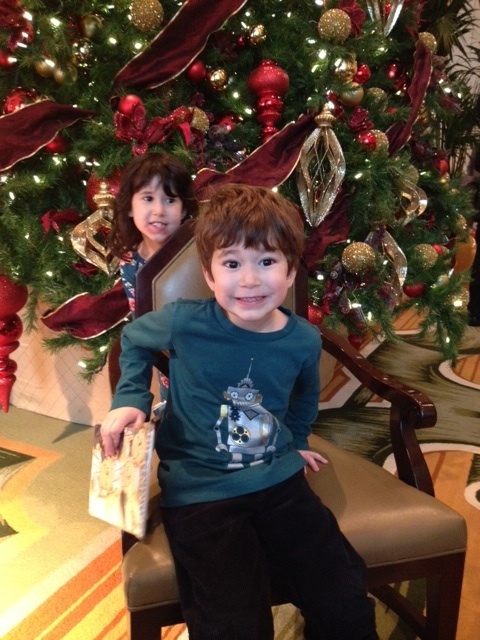 I hope you and your family have a fantastic 2014!